The Amber Shores of Littonia: [To Do: Edit]. The actual released title for "The Amber Shores of Littonia" was "The Kingdom of Littonia," a production error on the part of the editor. In the map "The Kingdom of Oceansend and The Norwold Coast," "the Norwold Coast" was supposed to have been "the Tranquil Coast." Any news on GazF11 & F12? I don't like your chances of getting a result.. it's been over 10 years, and OldDawg hasn't logged in here since Feb 2017. Actually, part of the Leeha Gazetteer was published in Threshold Magazine. Check the Norwold issues. I hope everyone is well. Still, it’s been a lot of work done fleshing out the world. Fantastic effort and results. Last time I heard, OldDawg has a lot of exciting things going on in his Real Life that keeps him from doing much in gaming at the moment, but I know he was hoping to return to this series at some point in the future. Say his name often enough, and the OldDawg might poke his head in the door. For those who have followed GazF and the mystara boards over the years (including the old boards at Hasbro), yes I had to step away from writing the gazetteers and actively contributing to the boards for a long while now. A lot of interesting turns of life, some rough health things, and most of all, working on tenure for an academic faculty job. I've always periodically come over and perused the Piazza, but couldn't actively participate time-wise. The short of it is: I've made it through two of three tenure votes (just need the formal university one in April), you can see me in two Marvel movies (and many other projects), I'm still working on the health but much better now that tenure decisions have been made, and come January, I should have more freedom to return to hobby writing. Great hearing from you again OldDawg! Thank's for the update on your experiences both good and bad. I am glad things are looking good for your health as well. Looking forward to seeing more of you from January! BTW, what do you mean we can see you in Marvel movies??? Last edited by fabriziohockey on Tue Mar 05, 2019 2:24 pm, edited 12 times in total. The work you have done is impressive! Expecially with the Norwold. Threshold 6, 7 and 8 have all relevant content on Norwold. Wow! I hope you get tenure. That'll help life ease up for you and should remove some unnecessary stress which I'm sure doesn't help with your health problems. What scenes/roles did you have in the MCU? That's an interesting project you're working on there! Threshold 6: 'The History of Leeha' (pages 23 - 37) by JTR. 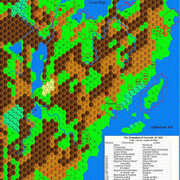 This article gives some really useful source material about the halflings living near the Great Bay in Norwold There is a particularly good map of the region on page 30. Threshold 7: 'A Travellers Guide to Norwold' (pages 5-123) by Simone Neri (Zendrolion). This excellent article has a huge amount of resource material about Norwold and so is bound to be of use. 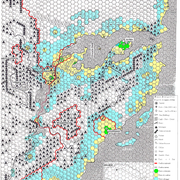 There are also two very good associated maps (also by Simone Neri) which can be found on pages 70 & 134. Threshold 7: 'Land and Races of Leeha' (pages 172 - 185) by JTR. This article follows on from 'The History of Leeha' referred to above and provides additional information about the region. Threshold 8, 9 & 10: 'Who's Who in the Wyrmsteeth' by Sturm (Parts 1,2 and 3). This excellent article gives lots of interesting background information about the Wyrmsteeth mountain range. The associated map is also very nice and can be found here: http://www.pandius.com/Wyrmsteeth_kingdom.JPG. This map can also be found on page 146 in Threshold 8. Hopefully this is all of some use to you! Thanks for checking - you've got the most recent one there, so no update is required!